Begin your journey from Tuqua and hike through the rough desert landscape to a beautiful overlook of the Dead Sea. 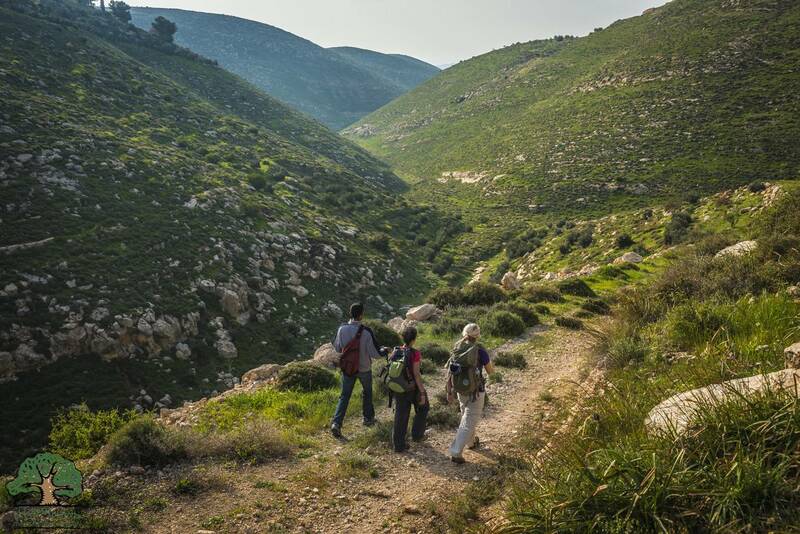 After leaving the desert, head towards Bani Na’im, a tranquil village famous for its surrounding grape orchards. There, your hosts will treat you to freshly made grape molasses (dibis) for breakfast, or serve a platter of savory Palestinian grape leaves stuffed with a mixture of meat and spiced rice for lunch. 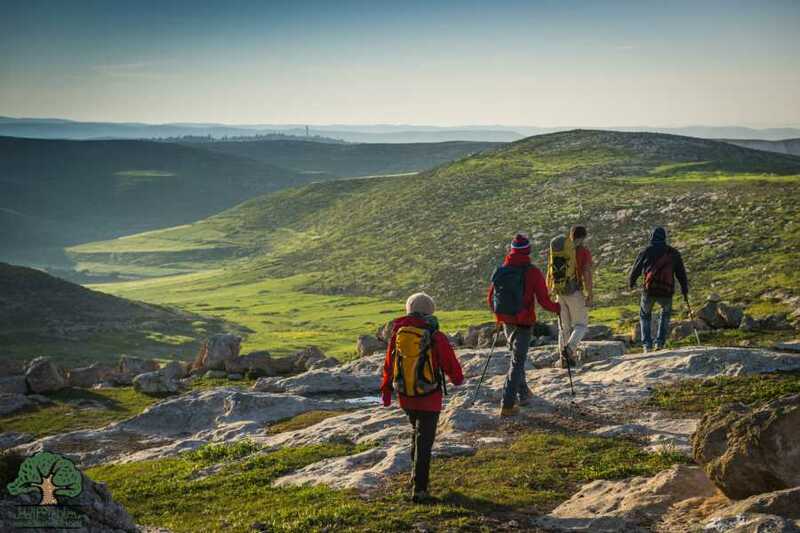 The trail will lead hikers towards the Old City of Hebron, home of Al-Ibrahimi Mosque, a place of conflict and spirituality and a symbol of struggle and hospitality. Follow the labyrinth of alleys, streets and courtyards through Hebron’s old quarters and mingle with the shopkeepers as you move towards the mosque. South of Hebron is the newest part of the Masar Ibrahim, particularly exciting to those interested in architecture and archaeological heritage. The new stages include impressive ruins of ancient monasteries, shrines, presses and cisterns. 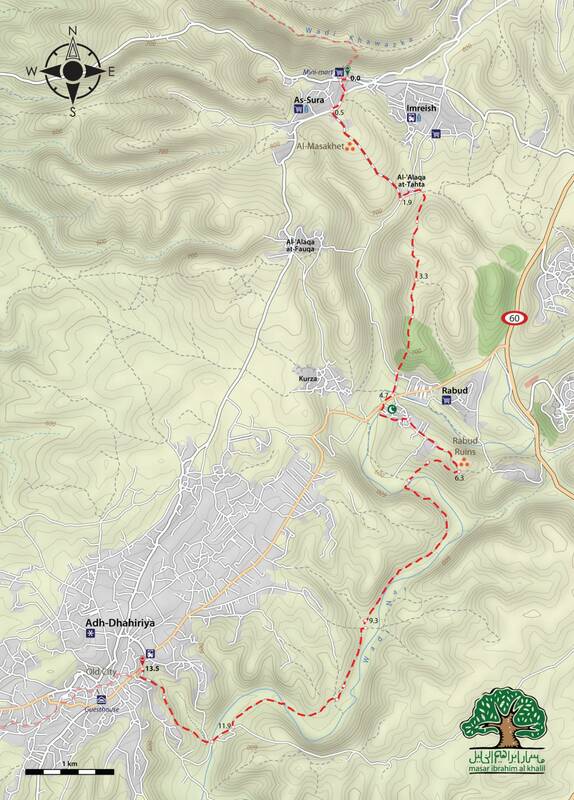 This walk will take us from Tequa through Wadi Jihar to the village of Rashaydeh, located about 20 km east of Hebron. The hike begins in the Jerusalem wilderness and descends into the spectacular Wadi Jihar, a deep limestone canyon. 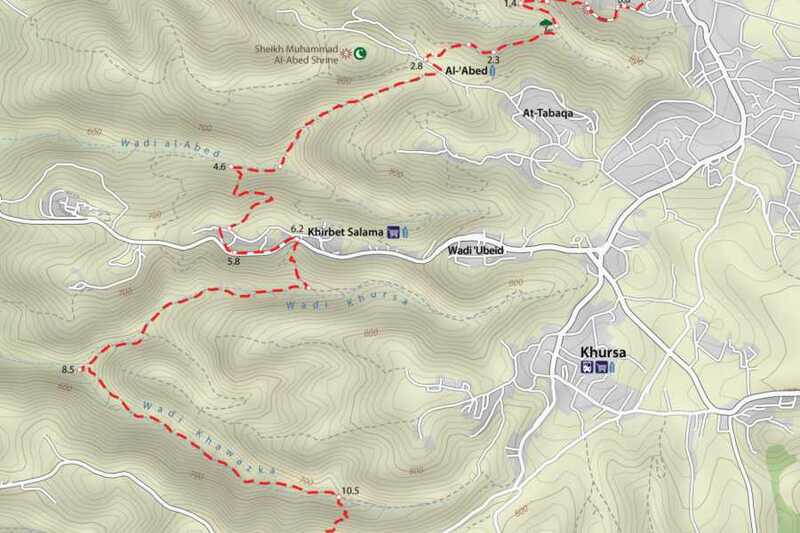 The hike from Tequa through Wadi Jihar will take about 4 hours, primarily on a rocky desert path, with a descent and few small climbs. 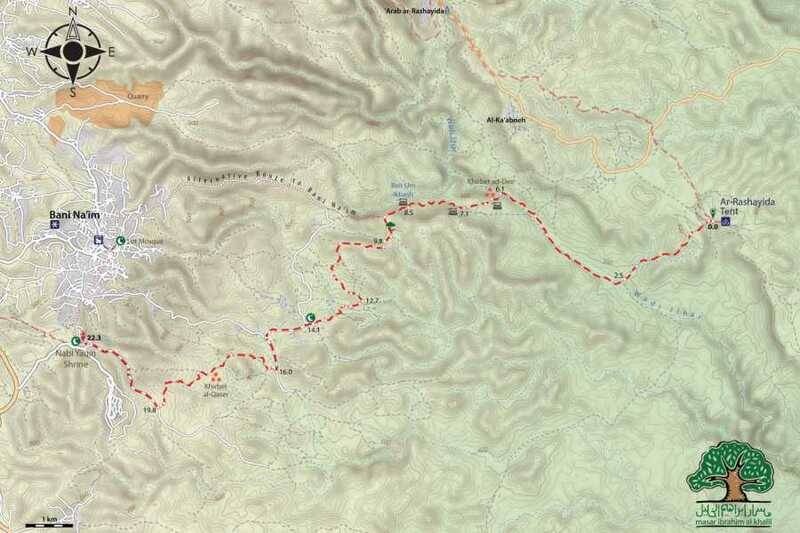 We will emerge from the valley and reach the village of Rashaydeh, and then continue walking toward the Bedouin tent just outside of Rashaydeh. 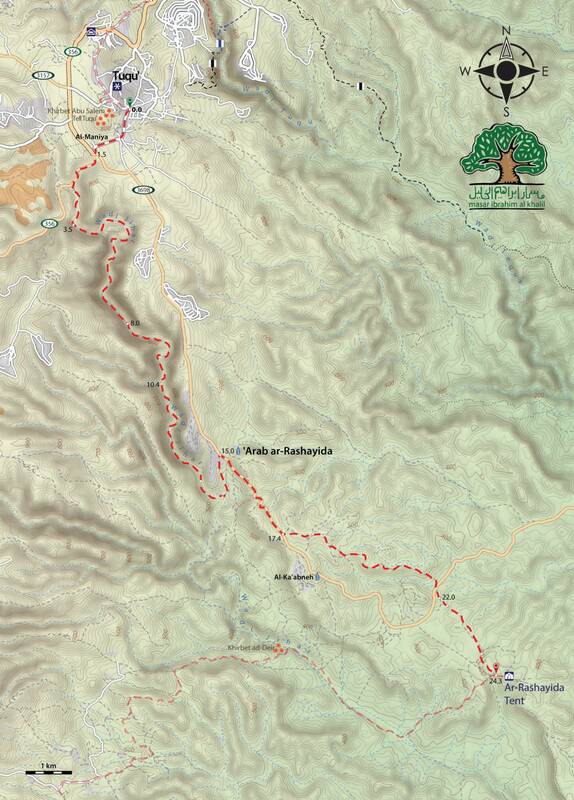 We will hike from the Rashaydeh desert area to Bani Naim, a mountain area from which Abraham watch the destruction of Sodom and Gomorrah in the Jordan Valley below. 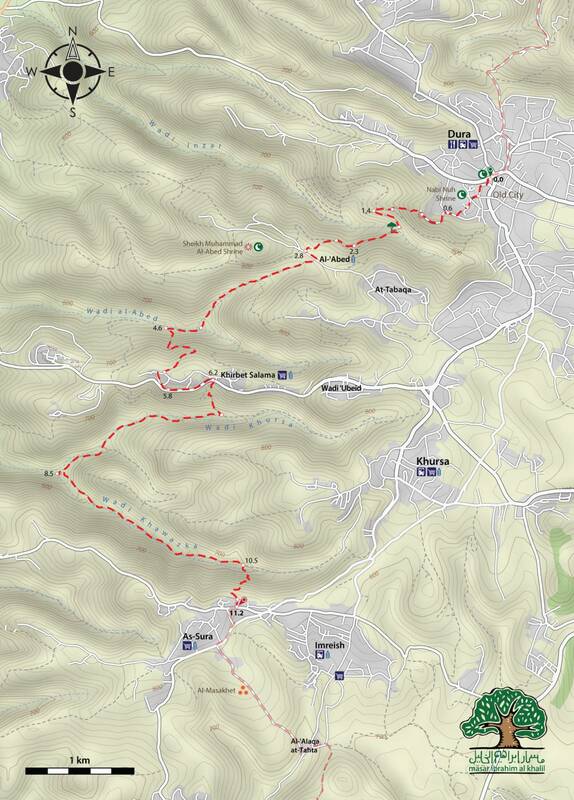 The terrain is rocky and uneven. 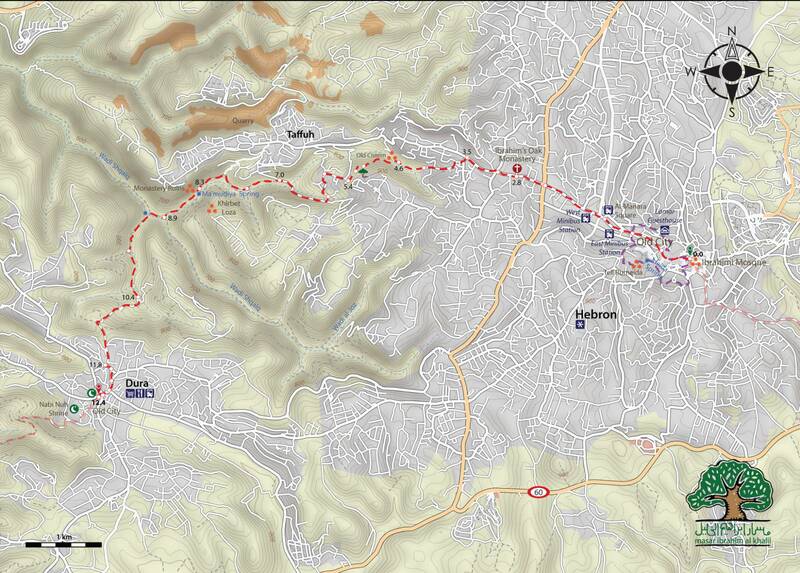 At the end of the day we will have a tour of the city and enjoy a cooking class with the women of Bani Naim. 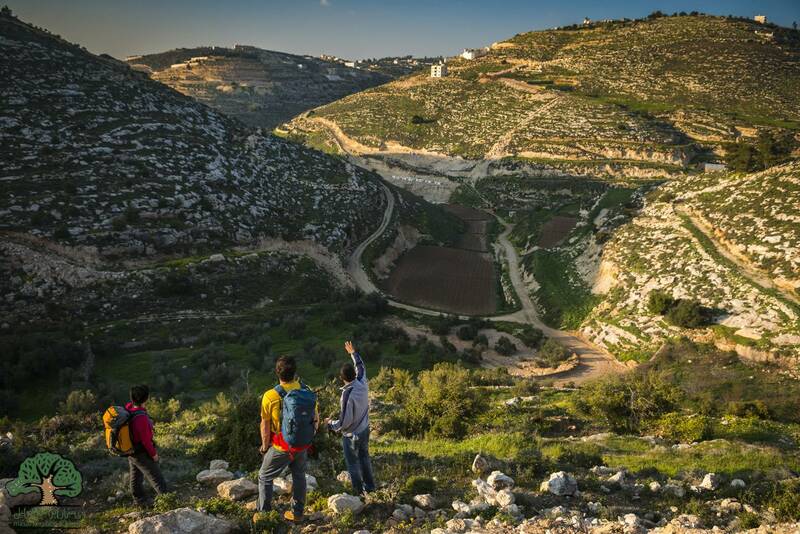 This section of the Masar winds through the mountainous region where Ibrahim interceded on behalf of Lot’s people. 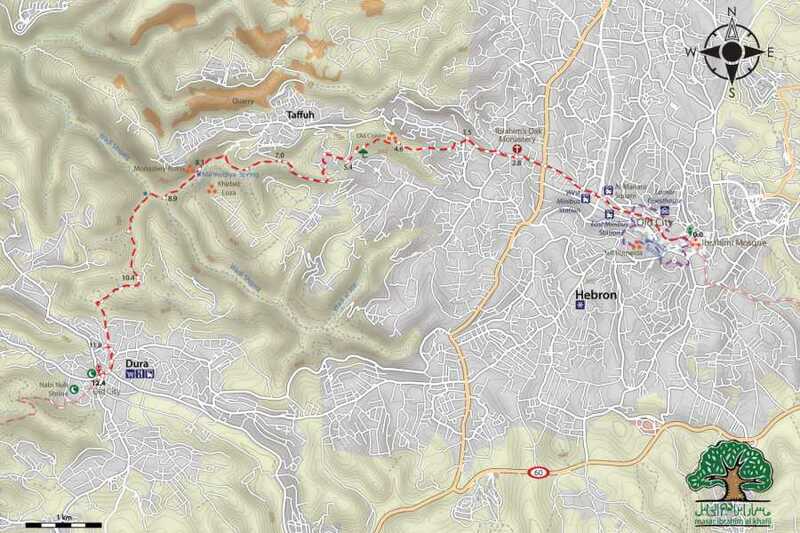 It will finish with Hebron city tour and enjoy the traditional Palestinian cuisine. 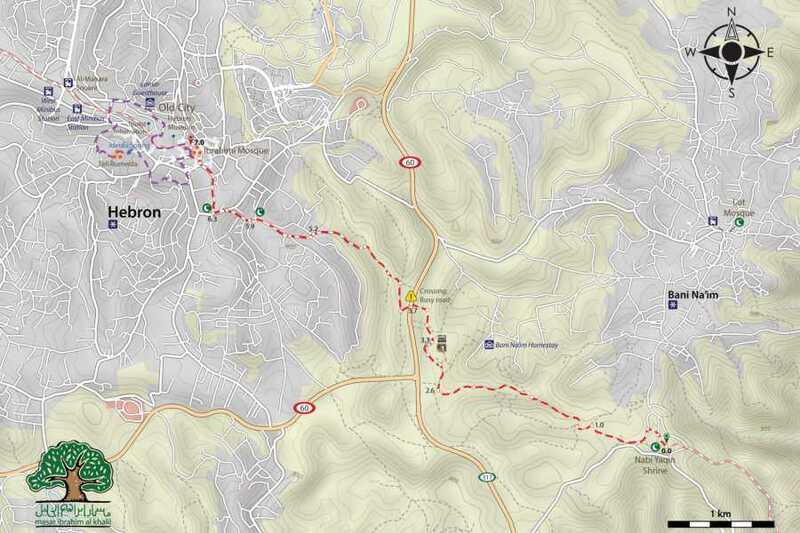 The Hebron to Dura day stage begins in the busy streets of Hebron, the path continues through the souqs and alleys of the Old City of Hebron, heading towards Dura. In Dura, hikers will start their day by visiting Dura Cooperative Association for Agricultural Production, where they can stamp their Hiker Passports and learn about the women’s cooperative. We will have the opportunity to purchase aromatic herbs, sweet raisins and hand made malban (dried grape juice rollups) - tasty snacks for the way. 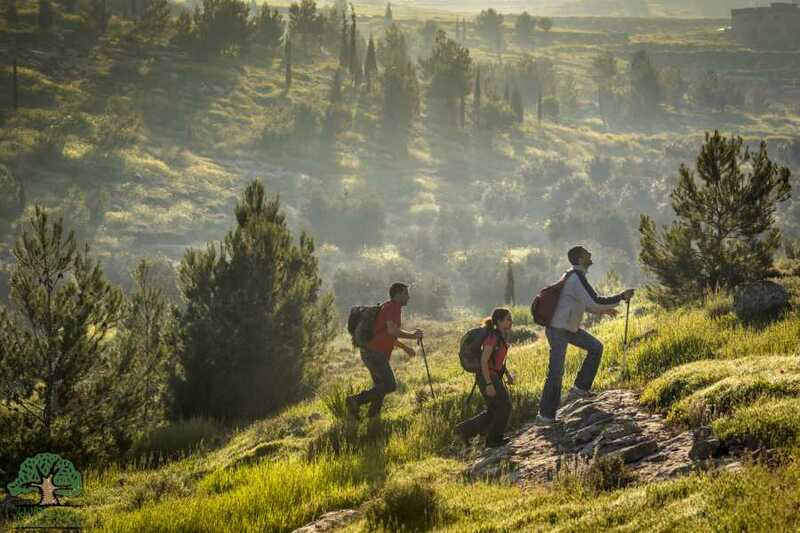 After leaving Dura the trail passes over hills and through scenic valleys covered with pine trees. 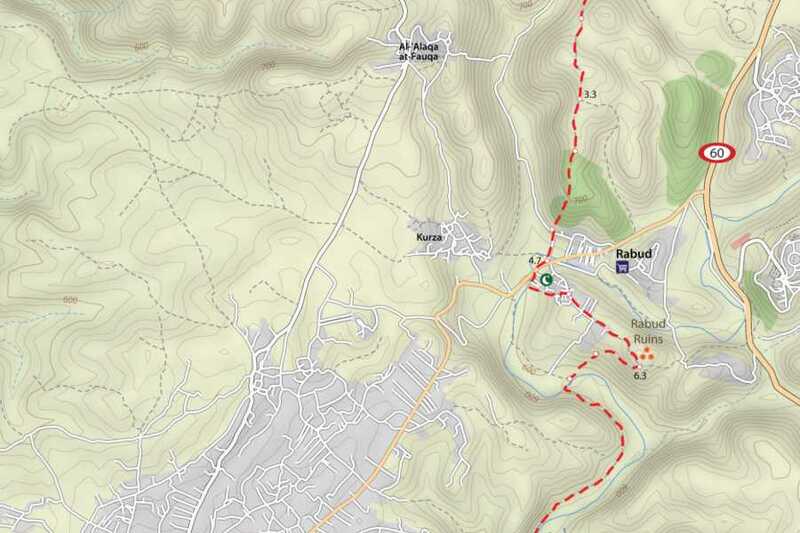 The final part of this section leads up the hill to As-Sura, a small agricultural village in the Hebron Governorate. 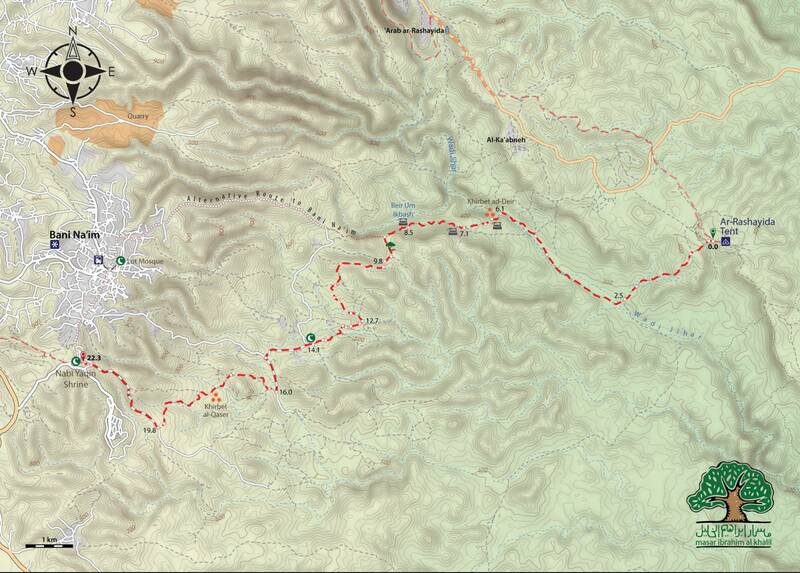 After passing through the rural areas surrounding As-Sur, the path to Adh-Dhahriya, leads through evergreen pine forests. 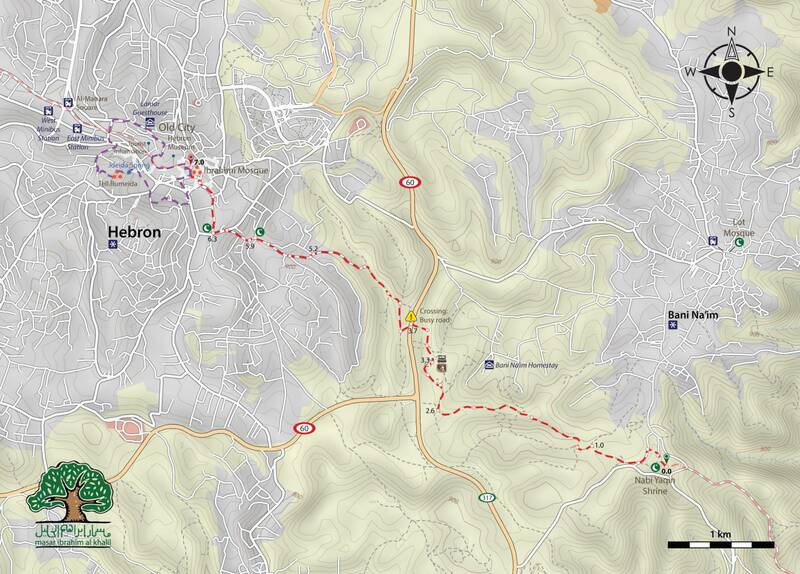 It continues towards Khirbet Rabud, the only major Late Bronze Age archaeological site in the mountains around Hebron. 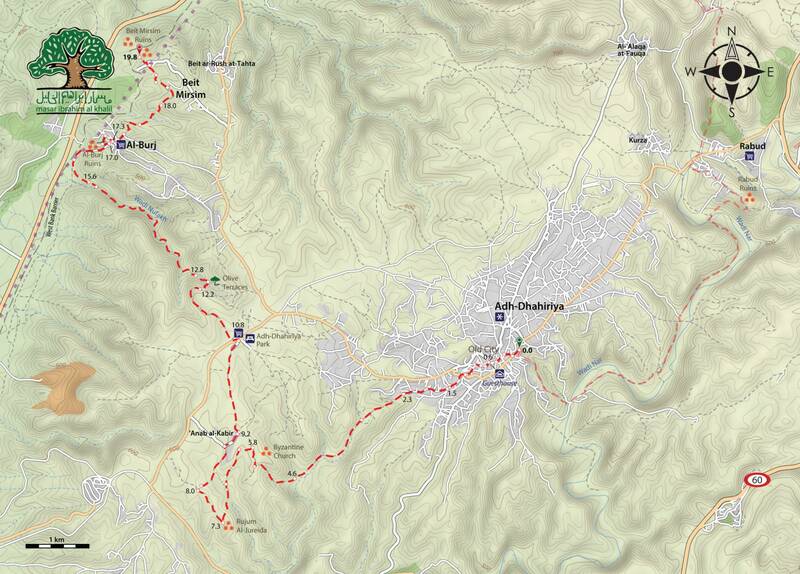 The final stage of Masar Ibrahim takes hikers on an exciting 19-kilometer hike between Adh-Dhahriya and Beit Mirsim.